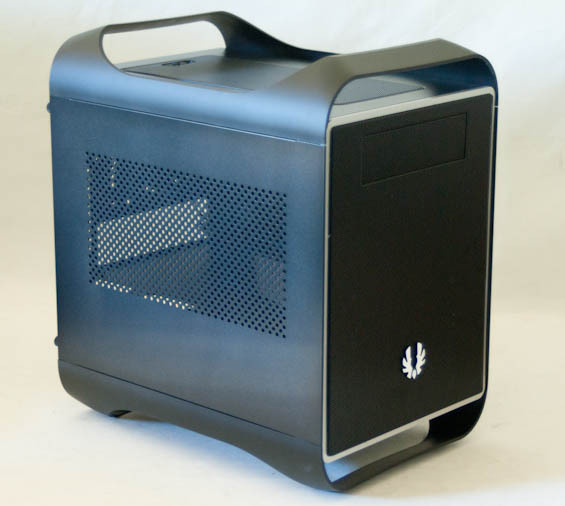 The mini-ITX form factor is starting to pick up steam these days, and with good reason. Micro-ATX boards are already capable of essentially hitting feature parity with full ATX boards, including multi-GPU support, while many mini-ITX boards include almost all the bells and whistles an end user could need. With the right board it's just not that hard to build a powerful gaming system in a fraction of the space it used to require. There's also been a slow trickle of new mini-ITX enclosures designed to support that kind of hardware, but even these enclosures have had their limits unless you were willing to spend through the nose on a Lian Li case. That changes today with the BitFenix Prodigy, a $79, full-frills mini-ITX enclosure designed for maximum performance in minimum space. If you're looking to build a powerful mini-ITX system with a single graphics card, this may very well be the case you've been waiting for. Drive Bays External 1x 5.25"
Internal 2x 3.5"/2.5", 3x 3.5"/2.5" in modular cage, 4x 2.5"
Dimensions 9.84" x 15.9" x 14.1"
Ordinarily in the spec sheet I wouldn't mention support for a 240mm radiator as a special feature, but on the BitFenix Prodigy things are a bit different. Take a moment to really let all that expandability sink in; even with just a 230mm intake fan and a 140mm exhaust, you could turn this case into an incredibly efficient and incredibly quiet enclosure. It's remarkably flexible for its size, essentially allowing the end user to make a series of tradeoffs to suit the needs of their build. If you're willing to give up the 5.25" bay, you can easily fit a 240mm radiator in the top. If you want to install a full-sized graphics card, you can remove the middle modular drive cage. You're down three 3.5" drive bays, but there are still two left over in the bottom of the case. These are all compromises but they're your compromises to make depending on your needs. Let's find out just how it all fits together, shall we? Very interesting times in the Mini-ITX world. When your stuff's not on Newegg, there *IS* no volume. Pressure from customers on both parties will get the deal done though. There's one issue with shopping from us.NCIX.com that's either a minor curiosity or an extreme annoyance depending on your perspective and/or situation: because they're a Canadian company doing business in America (even shipping out of California...) they SOMEHOW raise red flags with certain bank/credit card companies' anti-fraud units when you buy from them using a credit card. NCIX (hilariously) informs you of this snafu during the order process/on their site so I wasn't blindsided, and I think they take paypal which would presumably be a solution, but there's nothing like wrangling with the completely automated anti-fraud process of your bank at 10 in the morning when you're trying to get something else done. They're one of if not the biggest online computer stores in Canada (been around since 1996). There are a bunch of sister companies that operate separate stores like DIrectCanada, BestDirect, etc.